Many customers believe that South Lakes Housing automatically insure their furniture, belongings and decorations against fire, theft, vandalism or water damage such as burst pipes. THIS IS NOT THE CASE. Unfortunately some customers only realise this after the damage has been done. We make it easy for you to insure your belongings under a special household contents insurance scheme. The insurance is arranged with Royal & Sun Alliance Insurance plc and is available only to South Lakes Housing customers. There are 2 cover levels for you to decide from. Simple cover does not include any cover for Accidental Damage. You also have the option to add cover for Personal Belongings, Hearing Aids, Wheelchairs or Pedal Cycle to Simple or Simple+. The costs for covers are all detailed at the back of this pack. Most of your household goods and contents including pedal cycles and computer equipment are insured when in your home. They are covered against loss or damage caused by specific events such as theft, fire and flood. Also insured are lost or stolen keys, freezer contents, your own legal liability to the public and the cost of alternative accommodation. Improvements you have made to your home such as fitted kitchens, bathrooms, wardrobes, laminate flooring, patio doors etc (but not greenhouses or conservatories). Simple+ includes Accidental Damage cover. For general enquiries please call 03456 718 172. Calls may be recorded or monitored. Your household contents and personal belongings – furniture, TV, clothing, carpets and electrical goods – are insured against loss or damage while they are in your home. The insurance covers specified circumstances including theft, vandalism, fire, flood and escaping water (e.g. from a washing machine or bath). A single item limit of £1,500 applies to contents. Tenants liability – Up to 20% of the sum insured for damage to buildings and internal decorations. Accidental breakage of mirrors, ceramic hobs in free standing cookers or glass which forms part of the furniture in the home. Fridge / Freezer contents – Contents Sum Insured. Locks and keys – Up to £500. £5,000 Accidental Death benefit as a result of an accident in the home, while travelling as a fare paying passenger by train, bus or taxi or an assault in the street. Contents while in the open on the land belonging to your home are insured against loss or damage in specified circumstances including theft, fire and flood – Up to £500. Student possessions which belong to or are the legal responsibility of students while temporarily removed from your home to student lodgings are insured against loss of or damage in specified circumstances including theft, fire and flood – Up to £2,500. Theft of money by bogus officials – Up to £300. Trees, shrubs, plants, hedges and lawns on the land belonging to your home are insured against specified circumstances including theft, fire and vandalism – Up to £250. Valuables are items which are particularly prone to theft, such as jewellery, watches, clocks, articles of precious metal, pictures, works of art and stamp, coin and medal collections. Valuables are covered in total up to 1/3 of the contents sum insured and a single item limit of £1,500 applies. No excess applies to this cover. 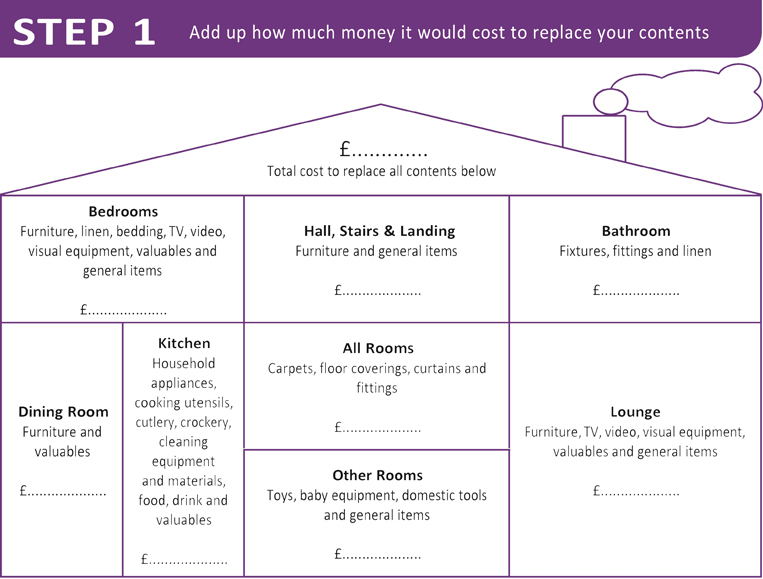 All the cover provided by Simple, plus cover for accidental damage to the contents of your home – Excludes damage to clothing, contact lenses, food, drink and plants. Up to £3,000 cover available for personal belongings, including sports equipment whilst in the British Isles and temporarily elsewhere in Europe up to a maximum of 14 days. Please note: Personal Belongings cover is subject to a single article limit of £350. Up to £3,000 cover available for hearing aids and wheelchairs whilst in the British Isles and temporarily elsewhere in Europe up to a maximum of 14 days. Up to £3000 cover available for loss or damage to your Pedal Cycles against specified causes such as fire, theft, storm and flood. Please note this Policy is not a maintenance contract, it does not cover all losses. Loss or damage by scorching without a fire actually starting. Loss or damage by wear and tear, maintenance, electrical, mechanical or electronic breakdown, leaks and anything which happens gradually, radioactive contamination, war risks, sonic bangs, pollution or contamination, rot, date change and computer viruses and terrorism. Any items used for business or professional purposes. Losses by certain causes when the home has been unoccupied for more than 60 days in a row. This is only a brief summary of what the Policy does and does not cover. Full details of the conditions and exclusions are given in the Policy; a specimen Policy document is available on request. Please read the important information which follows including the declaration and remember to sign and date the application form.A copy of the completed Application Form is available on request but you should keep a record of all information supplied to us for the purpose of entering into this contract. A specimen policy is available on request. Your answers to our questions are important and provided you have answered them to the best of your knowledge and belief, we consider that you have fulfilled your requirements. You should tell us if any of these details are incorrect or change. We may reassess your cover, terms and premiums when we are told about changes in your circumstances. If you do not tell us about any changes, or give us incorrect information, the wrong terms may be quoted, a claim might be rejected or payment could be reduced. If there is insufficient space for your response, please continue on a separate sheet of paper if necessary. RSA will treat your personal information fairly and lawfully in accordance with the Data Protection Act 1998. Insurers pass information to the Claims and Underwriting Exchange Register, run by Insurance Database Services Ltd (IDS Ltd). The aim is to help us to check information provided and also to prevent fraudulent claims. When we deal with your request for insurance, we may search the register. When you tell us about an incident (such as fire, water damage or theft) which may or may not give rise to a claim, we will pass information relating to it to the register. You can ask us for more information about this. 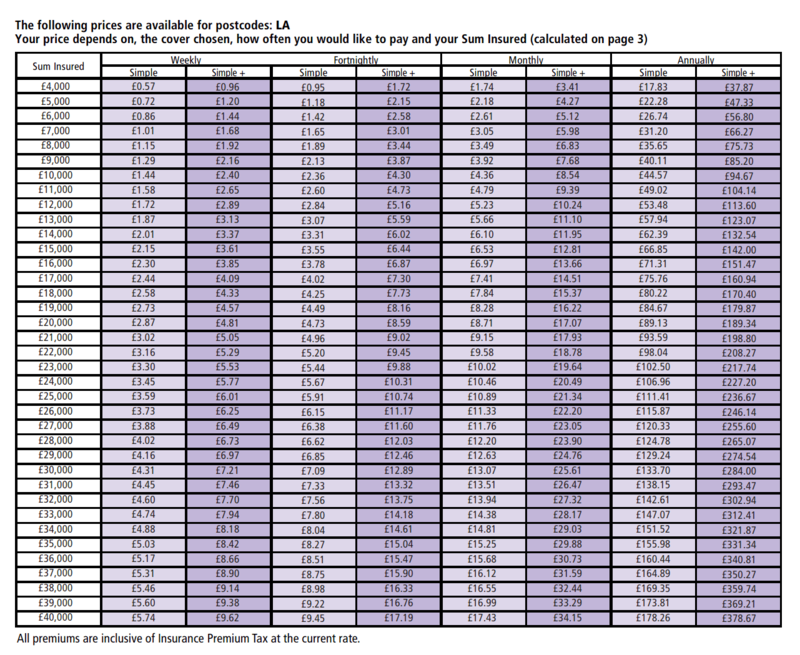 You should show this notice to anyone who has an interest in property insured under the policy. Both you and we may choose the law which applies to this contract. However, unless you and we agree otherwise, the law which applies is the law applicable in the part of the United Kingdom, Channel Islands or Isle of Man in which you live. Full details will be provided in your policy documentation. 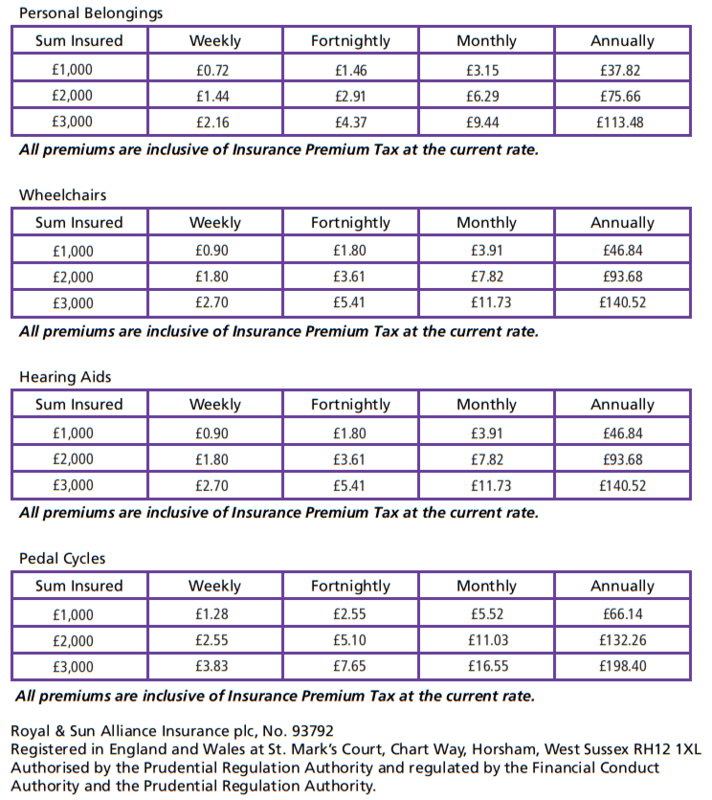 Policies are underwritten by Royal & Sun Alliance Insurance plc. Please note that Royal & Sun Alliance Insurance plc is unable to provide insurance in circumstances where to do so would be in breach of any financial sanctions imposed by the United Nations or any government, governmental or judicial body or regulatory agency. Full details will be provided in your policy documentation. We have a complaints procedure in place, both with an independent facility and in-house. For further details please refer to your policy document. You will receive your policy documents soon. If you have any queries before you have received the details please feel free to call us and we will be pleased to help you. You have the right to take your case to the Financial Ombudsman Service. If having examined your policy you decide not to proceed with the insurance, you will have 14 days to cancel it starting on the day you receive the policy documentation. On receipt of your written notice we will refund any premiums already paid, unless we have been notified of a claim. RSA has the right to refuse any application which does not meet its underwriting eligibility criteria under the scheme. Important Note: Before you sign this form, please read it again making sure all questions are answered in full. Check that the answers which have been given are correct. Once you and any joint applicant sign this form you are responsible for its accuracy. To give false information knowingly in answer to any of the questions in order to obtain insurance or to obtain a reduced premium could be a criminal offence and will certainly invalidate your insurance. I/We declare that to the best of my/our knowledge and belief the statements made by me/us or on my/our behalf are true and complete. I/we have provided and I/we authorise the giving of information for such purposes. Please fill out all of the fields in the form below to proceed with your application. Joint applicants must be named and must sign this form otherwise cover for them will not be in force. * Do you require the extension in cover for Personal Belongings? * Do you require the extension in cover for Wheelchairs? * Do you require the extension in cover for Hearing Aids? * Do you require the extension for Pedal Cycles? * Have you or any member of your family who normally live with you at your current address or elsewhere made any household contents claims in the last 5 years? * Have you or any member of your family who normally live with you at your current address or elsewhere had insurance cancelled, declined or declared void or had special terms or conditions applied? * Have you or any member of your family who normally live with you at your current address or elsewhere been convicted of any offence other than driving offences? * Has the home or the land belonging to it been flooded in the last 5 years? * Will the home be left unoccupied for a total of more than 60 days in a year? * Will the home be occupied by anyone other than you or your family? * If yes, how many people other than you or your family will occupy the home with you? Your answers to our questions are important and provided you have answered them to the best of your knowledge and belief, we consider that you have fulfilled your requirements. You should tell us if any of these details are incorrect or change. We may reassess your cover, terms and premiums when we are told about changes in your circumstances. If you do not tell us about any changes, or give us incorrect information, the wrong terms may be quoted, a claim might be rejected or payment could be reduced. In certain circumstances your policy might be invalid and you may not be entitled to a refund of premium. it is important that the Sum Insured is sufficient to replace ALL household goods and personal belongings.